Sea Captain is produced by a software games developer called Real Time Gaming and is by far one of their most popular games and certainly not without good reason. This online casino slot game has 5 reels and 25 paylines. Thanks to the fact that there is a very favorable coin range, lots of features to enjoy, generous free spins awards, an attractive, pleasing soundtrack, as well as a well-constructed theme and symbols, Sea Captain is a great, solid slot game to play. The only possible disadvantages are that there is no multiplier symbol in the game and there is no progressive jackpot. However, aside from that, there really is nothing to warrant giving this video slot game a miss and it is sure to keep players coming back for more. Players can wager a maximum of one coin per activated payline which suits players no matter where they fall on the betting spectrum, whether low, mid, or high rollers, thereby ensuring that this game is likely to appeal to a much wider audience than some others. 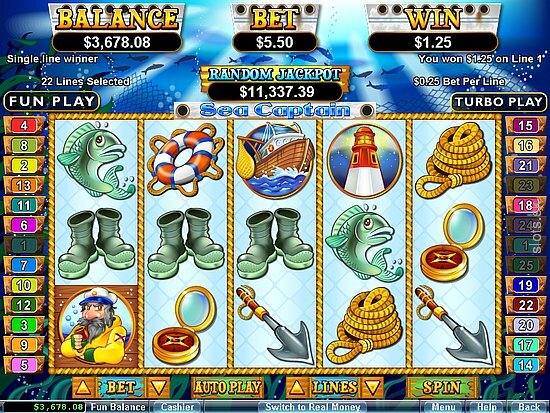 As might be expected given the title, the Sea Captain video slot game follows an oceanic and fishing theme and boasts attractive symbols and a pleasant soundtrack. An auto-play feature is also provided for those that have other things to do but still want to play the game even when they cannot be available to interact with the software. The interface is use-friendly and it is a fast-paced game with lots of fun, great winning opportunities and excitement. The Wild symbol in the game is the Squid with its amusing animation. It appears on both the second and the fourth reels. When the Wild Squid turns up on the reels along with the Ship symbol, players can win an impressive 10,000 coin jackpot. However, this is not the only available jackpot offered in the Sea Captain video slot game, because there is a second jackpot. This second jackpot is triggered by the Lighthouse symbol. When it appears in conjunction with the Wild symbol, the jackpot is 5,000 coins. Furthermore, the Wild symbol also acts as a substitute to complete winning combinations. But this is not all, because when this occurs, the payout is doubled. The Scatter symbol is the Sea Captain himself and this symbol can award players with a lot of free spins. In fact, seven free spins are awarded whenever the Sea Captain appears three to five times on the reels. What is more is that any payouts won during free spins are automatically tripled. A very handy and advantageous fact about the free spins is that if, while playing the free spins Bonus round, the Sea Captain should make an appearance on the reels again, players are awarded even more free spins. Players should also note that there is no limit to how many free spins they can win when the Sea Captain appears in the free spins Bonus round. All in all, this means that players can win as many as 30,000 coins from free spins alone, which makes this a very generous feature indeed. The animation and graphics are beautiful and colorful which simply further help to ensure the game’s appeal. The Sea Captain himself is resplendent in his typically nautical attire with his beard and bubble-blowing pipe. In fact, it is not just the Sea Captain’s pipe that is a particularly charming animation. The squid symbol also boasts an entertaining animation. The other regular symbols are not animated but are nonetheless very attractive and help to ensure that this video casino slot game is very aesthetically pleasing and hugely entertaining as well. With its great winning potential, limitless free spin Bonus round, excellent graphics and generous Scatter symbol, Sea Captain is, without a doubt, one of the most enjoyable and rewarding video slot game out there and definitely one worth trying.